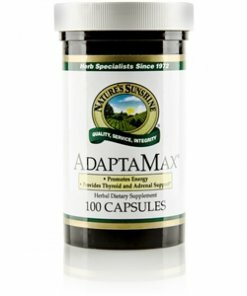 Nature’s Sunshine AdaptaMax® boosts energy levels and stimulates the immune system. A unique blend of Rhodiola rosea, Eleutherococcus senticosus, Korean ginseng, ashwaganda, rosemary, Gynostemma pentaphyllum and schizandra, this formula helps the body copy with fatigue and aging while protecting the cells from oxidative damage. AdaptaMax also promotes a positive mood and fortifies the immune system. Broccoli, carrot, red beet, rosemary, tomato, turmeric, cabbage, Chinese cabbage, grapefruit bioflavonoid, hesperidin, orange bioflavonoid, gelatin, and water.